There are plenty of articles around for inter process communication, using remoting, custom windows messages and named pipes. In my .net career I think I’ve used all of them. In this article I’ll outline a technique I’ll be using that I think is quite simple. In .net Framework 2.0, Microsoft introduced the new System.Runtime.Remoting.Channels.Ipc remoting channel , which provides one of the easiest (prior to using WCF) techniques. 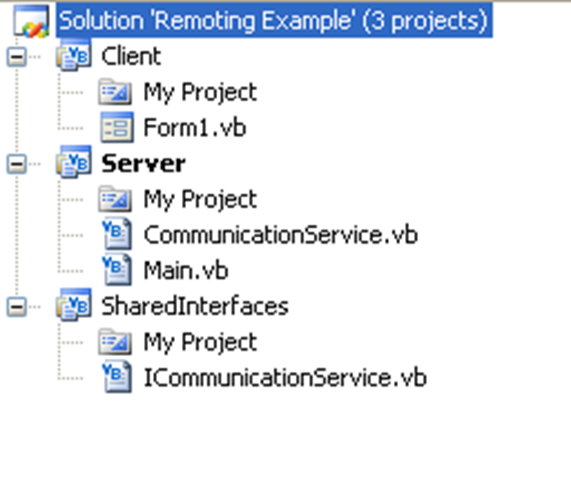 In this example we have a single server process which is communicated to via client processes. Firstly, as with all remoting it is necessary to share a type that defines the api you desire between client and server processes. One of the easiest things to do is to create an interface. For the Server in this example, I created a console application (it can be any sort of process). The code basically gets a reference to the remote object and invokes the “SaySomething” message, passing through a value. As you can see, it doesn’t take much code to communicate between processes. Further improvements to the code will involve ensuring security (making sure that only desirable client processes are calling). Download a zip file containing the entire project for Visual Studio 2008. Very usable example. You too much help me. Thanks. This article looks great but unfortunately I can’t seem to get it to work with .NET framework v3.5 and Visual Basic 2008. It fails on the line ‘Imports System.Runtime.Remoting.Channels.Ipc’ as it cannot find ‘Ipc’. I wonder what I am doing wrong! Simply add a reference to “System.Runtime.Remoting” and ipc remoting bliss will be yours. Great article and sample code. I have a requirement to create an “Instant Messenger” application and as such need the “Server” and “Client” pieces to reside within a single program. Can’t seem to find the magic combination – any suggestions would be greatly appreciated. This example worked fine for my purposes. I did use the console app for the Server portion like this example shows. What I would like to do is use a Windows Form instead of a console app to display my values passed through the SaySomething method. When I attempt to create a Form and startup my application as a Windows Application (not a console app) I am unable to reference and modify the label on the Server form. I’ve determined the CommunicationService Class is a separate thread from the one launched through the Server form I’ve created. Is there a way to have this SaySomething method in the Server app reference the new Windows form I’ve created? There are a few ways to communicate between threads in this scenario. One way is to put a reference to your display form in a “Shared” variable, then use the “BeginInvoke” method on the form to update the text property. Another way is to store the “say” text in a collection, exposed as a shared variable, then use a timer on the Winform to periodically bind (read the data from) the collection if the data changes. There is just one thing I can’t deal with – if you wanna combine server and client in one program, the code in the “SaySomething” method is done twice, ain’t it? It’s me again – found a solution. Problem was that I was using windowsform – object in the “SaySomething” method. Sure it’s just fired by the server side, but as there are two instances of the program with the windowsform – object being public, my application did it once for the form in Instance I and then for form in instance II. If anyone needs the solution code, just mail. Nice evening to ya all. I hope this saves someone else the 2 hours of grief I had trying to get it to work. This is a great article, but I’m having some difficulties. I’ve followed your directions and got two applications communicating well. However, in the “SaySomething” sub, instead of a simple console.writeline command, I decided to call another subroutine that is in the code for one of my forms. This subroutine is attempting to change the form in some way — add text to a label, change the opacity of the form, whatever — however, I can’t seem to manipulate the form at all. Does anyone know why? PLEASE HELP. Applications written as Winforms or WPF have to have their UI elements (such as labels and textboxes) updated on the “UI Thread”. Because “Say Something” is invoked by a non-ui thread, you have to to “marshall” the update onto the ui thread. Cannot load type ‘someapp.SharedInterfaces.ICommunicationService, someapp, Version=1.0.0.0, Culture=neutral, PublicKeyToken=null’. I appreciate the attempt but I wasted over an hour discovering that the examples presented here are incomplete and lead to an exercise in troubleshooting. I experienced each and every error described in the comments. I wonder if this post causes more confusion for novices like me than is reasonable. I also wonder why the post hasn’t been ammended. By the time I hit the last (unanswered) problem described in comment #15 from Miha I decided to abandon this post altogether, but not before leaving this message as a warning to others like me who are easily confused. I’m sorry that you had so much trouble. If you’re still interested I have updated the article to include a link to the (now upgraded) Visual Studio 2008 project. I hope this helps you and anyone else who may be experiencing problems. The article is intended as a simple introduction to remoting. I recommend further reading on the subject before creating production code that uses these techniques. Please keep in mind that since .net 3.5, wcf provides a more modern alternative to remoting. 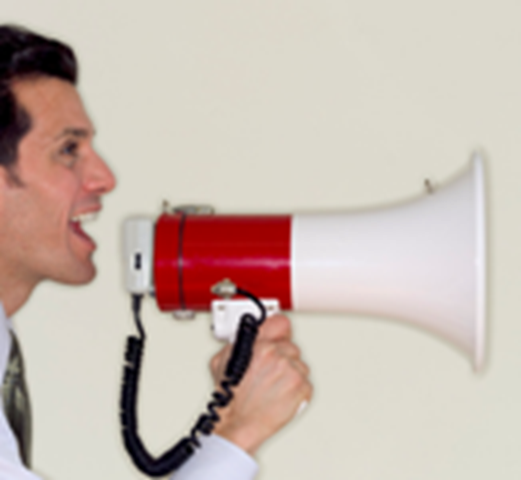 Please note that comments included in this forum must be improved by me before they appear. Oops. I just went to download the project and I got some sort of 404/error. BTW: Thanks for the updated project. I appreciate it. I am trying to learn how a 64-bit process can communicate with a 32-bit process so that the 64-bit process can indirectly call functions in a 32-bit COM Component hosted in the 32-bit process. The 32-bit COM component can not be updated to x64. The link to the VS2008 version leads to a 404. Could you repost it? I’m eager to try it! Hello, everyone! After finding this nice post here, I needed to do this in such a fashion that a single application would do one thing with the first instance, but the second instance would do something else. Hi. I tryed to implement this example in vb 2010 and it works fine. My problem is very similar but i’m not able to solve it. I’ve two processes: the first with a timer that update the text field of a label each second; and the second that has only one button which ‘click’ event reads the value of the label of the first process. I tryed to make a shared interface in the timer form and to return the value of the label (similar to this example), but i read only 0. Can you help me??? new to all this. i changed the server from a console to a form. i am able to get what is sent popping up as a message box on the server. the thing is i am trying to get it to change the text on a label instead of a message box popping up. i added a line to change the text on a label on the form to what has been received but it is just not happening! 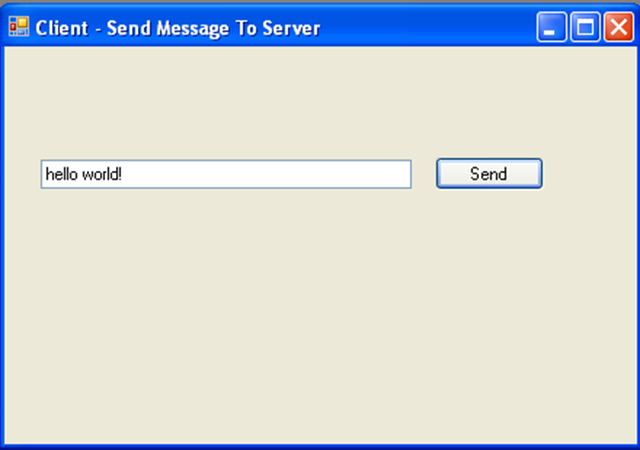 it is receiving the string that is sent as the message box is set to run after the label text change line. i have even tried putting in a line of code that will call a sub written in the form module itself to check a checkbox…. but that wont work! what is it that i am not doing? this is what i am trying to accomplish…. 2) cause procedures or events to run just by sending a string that a Select Case determines by what it receives. Thanks for this simple sample code. This has answered the question I have had after previously having trouble with the compiler not recognising the “ipc” in “Imports System.Runtime.Remoting.Channels.Ipc” for some reason. I have just spent a few hours searching for alternatives after initially being misled into believing the VB did not support the “ipc” interface directly, now I have this simple sample I can find out were I am going wrong with my original code.